The Hawsons specialist corporate finance and tax teams have worked closely with the Read family at Podington Garden Centre on the completion of their sale to Wyevale Garden Centres. The Read family started Northamptonshire-based Podington Garden Centre over 35 years ago as a small nursery, and have since grown it to be the leading multi-purpose garden centre in the region. The 60,000 sq ft garden centre has a 25,000 sq ft covered shop on 3.4 acres, and a plant area containing over 9,000 varieties. 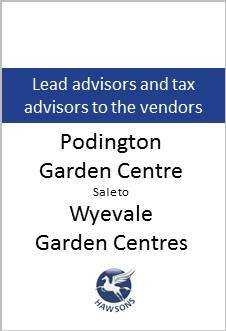 The acquisition of Podington from the Read family brings the number of Wyevale garden centres to over 140 across the UK.